Posted July 2, 2014 · "NEXT" YouMagine pre-release. RFC! "Printability rating of 0.0 from 0 users" does not seem useful. Why not hide that rating until there is an actual rating to display? Good point, perhaps: "Be the first to rate the prinability... but not: 0.0 from 0 users." ? Posted July 3, 2014 · "NEXT" YouMagine pre-release. RFC! Definitely noticed it - one can no longer view any of the images except the primary (first) one, and the 3D viewer is now broken. This is using Chrome on Mac. Posted July 9, 2014 · "NEXT" YouMagine pre-release. 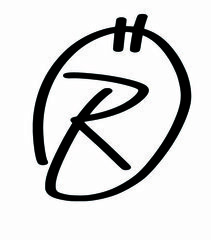 RFC! If you uploaded a lot of files by dragging them onto the Documents or Pictures box under "Add design" this would sometimes cause a problem. See this image for an example. On NEXT.youmagine.com there's now a serial upload. For the user it will work the same, but it will do uploads one by one and just schedule them for you. It works well, but we'd like you to give it a try before it goes live! Just added my SD/MicroSD Holder to the next test version and draged and droped 1 SCAD & 42 STL files in one go and they all uploaded succesfully. It looked at time it was hanging (paused on some files for a long time) but in the end they all succeded. It took me quit some tries to upload all the STL files on the WWW site, so a BIG improvement. Keep up the good work. Posted July 14, 2014 · "NEXT" YouMagine pre-release. RFC! The title of an unpublished design now looks as it would when published. This release now has a version number: r1.0. YouMagine will have its own blog! Posted July 29, 2014 · "NEXT" YouMagine pre-release. RFC! - The banner on the front page should minimize itself after a while (or when scrolling down, like the menu bar? or definitely after the first view, cookies hum?). I'm pretty sure most people don't notice you can reduce it, and it's eating half of the main page, that's a nice banner, but no real useful info and takes important space. I'm so much happier since I found that! - The Search icon is too small/not noticeable. Again, such an important feature. Another option would be to display the empty search field, it's something ("white rectangle") that catches your eyes, much more than this small icon. - When checking listing of designs, there should be a tooltip when hovering a design name, to display the full name of it. It often happens that the design name is too long and truncated and non-descriptive, and with the tooltip you wouldn't have to open the page to check what it is (or to read the URL down the browser bottom bar). - In a design page, the area right next to the picture needs some reshuffling: The 3 first items are aligned left, and the rest is centered. It looks wrong and messy. Also, the "favorite" button looks very lonely up there. I know there is another button when you check your own designs, but most people will never see it, so most people see an empty space. The top area of a webpage is critical, there is a lot of wasted space here. These were my 2 cents. 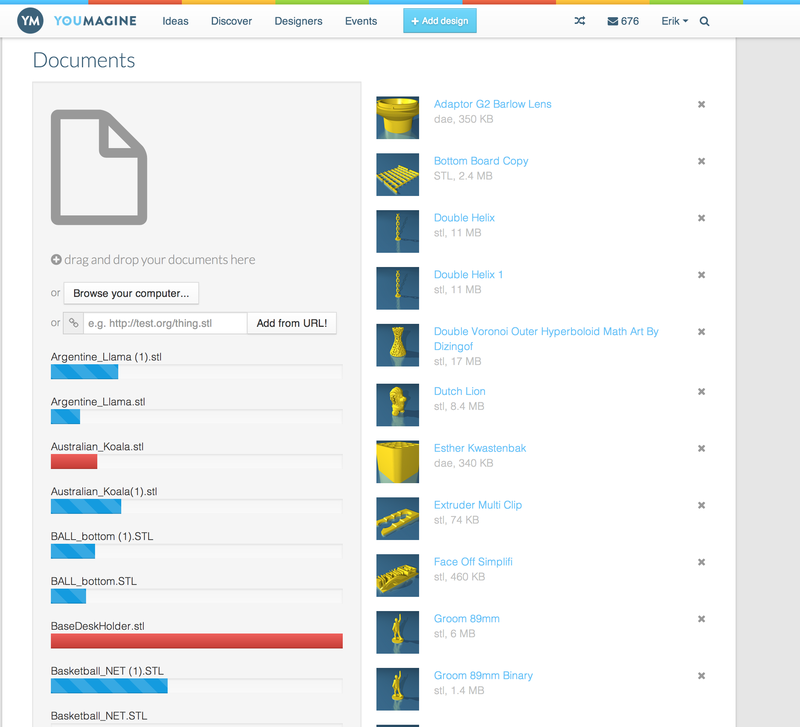 Overall Youmagine is clearly improving and the database growing, I will often visit it as often as Thingiverse. - Featured designs not refreshing often enough (maybe 6 is too much? ), and usually the cover picture is not sey at all (and sometimes not resized or cropped at best). Also they don't stand out of the other designs on the homepage. - In the Discover section, how are the "Popular" and "Trending" listing sorted? It should be based on the number of times a design has been printed, or at worst the number of download. Favorite doesn't mean anything, most of the time, it meant: "I liked your idea", but my bet would be that the favorites designs are not the most printed ones at all. Posted October 16, 2014 · "NEXT" YouMagine pre-release. RFC! @all: In the next couple of days we're about to release a major release. The most requested feature is being addressed: SEARCH! Some major features are that we've implemented an improved search engine. It should find many more items, and we can now rank results according to where the matches occur. The weight of importance of a match is title, then abstract then description. We're currently hosting a mirror of the entire site at http://youmagine-testing.herokuapp.com specifically so you can try out the search function today. This is a copy where you can test search, please don't publish things there because it's isolated from the live version. [*]Better support for mobile browsing! Not fully responsive yet, but its a first step! [*]We've added a "Collection" where you can add designs to a collection, e.g. 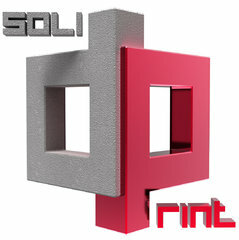 "Things to print", in addition to your favorites. [*]The "Designer" pages now have nice stats. [*]You can list your skills on your profile! [*]You can upload a zip file and choose "Expand" and it will extract the file for you adding its contents as documents. [*]You can nog log in an comment at the same time, if you were logged out. [*]We're finalizing Google+ signing as a possibility. [*]Lots of fixes, tweaks and improvements all over the site! Please go to http://youmagine-testing.herokuapp.com and then comment on the improvements and let us know whether you think they were implemented well. We can now still fix bugs that you might spot and that we're overlooking, or ask us to change something and we'll definitely consider it! (either for this or another release). P.s. 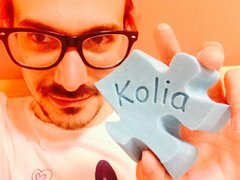 @kolia, thanks for all your feedback and encouragement! Well, since other people are chiming in with their complaints, I suppose I'll list some of my own. -The search is useless. Glad to see you're fixing that. -You have to click on the arrows to scroll through images, instead of being able to just view one of the thumbnails by clicking it. -Print-ability user rating? I received a 3 star rating for a model ( a model I printed 3 times absolutely perfectly). That's fine, but I don't get any comments on WHY they rated it a 3. it might be a simple fix for people who aren't running calibrated machines, or using an incorrect printer setting in Cura. It just says "rated a 3 by one user". Can't even see who the user was. -The server is ridiculously slow in the states. Combined with the terrible search, it could take me 15 minutes to find something due to slow speeds and surfing page after page. -Redundant results. Often times, when I go to page 2, some of the models from page one are still there, on to page 3.... half the models from page 2 are there. -Search box disappears. Very, very annoying. -user name at the top right is only 2 letters long on my browsers, looks like this "so.."
-email alerts need work. Too many steps to read a simple message. Posted October 17, 2014 · "NEXT" YouMagine pre-release. RFC! I don't see why I have to add a description to a collection, please allow to leave it blank. I find "trending" and "popular" a bit double, specially when it shows the same items sometimes. I agree with the comments on "printability rating" the risk is huge it says more about the skills of the person printing than about the quallity of the model. Would be nice to also focus on the ease of the upload proces, appart for fixing the many errors during upload i would be nice to be able to "drag and drop" change the order of the pictures. 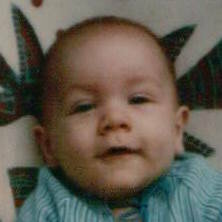 Also many time the first uploaded picture gives an error. Could not have a look at the 'designer' part, going to the user profile will only give an error. I see also mobile browsing has improved! nice. Also here continuous scrolling would be nice, or a least an option for more results per page. Posted October 19, 2014 · "NEXT" YouMagine pre-release. RFC! @Kolia, almost all of your issues made it into the development tracker in some way! The issue with starting on the 3rd page with search will be fixed before the release. Description of a collection will become optional! Trending and popular are similar. We're working on a better way to match new design you may be interested in by looking at things you've downloaded, liked and/or printed and make a more personal recommendation for new items. The printability will indeed require more information and shouldn't be about "good or bad" design, but more about "Easy print vs. challenging" and then related to the printer that was used! This rating will be merged with the "I made this" functionality where you can also enter your printer and the profile used. The upload process should already have improved by a lot because the images are uploaded serially instead of in parallel. This means that individual images will be uploaded faster and the next one begins uploading as soon as the previous one finished. If you're still having that problem, let me know! Drag and drop re-ordering! Yes, that makes sense, but it's a lot of work I will definitely keep it in mind. The error related to your profile should become fixed "really soon" ! Posted October 20, 2014 · "NEXT" YouMagine pre-release. RFC! I like also the little picture in the Activity tab to show the preview of the design. Collections is something i've been waiting, for the moment the only way i found to keep track of the things i like is to favorite them so that's a great plus. I've only test with 4 collections with 2 designs each in the Profile page it shows all the collections one under an other. Does it show the entire collections or after a couple of designs (4 - 10) a button show more appears? By the way if you are still looking for a RoR developer, I may know one (not me), freelancer in Berlin (not Dutch though). Good point, we can and will probably paginate them for performance reasons. Of course it makes sense to display at least 12 items for each collection and then a series of pages or a "More..." button to zoom in on a specific collection. @Kolia: If he/she is good, feel free to let him contact us at info@youmagine.com and include a resume / showcase and motivation letter. The new release is now live! We have rolled back the release about 1 hour ago because download links didn't work, but now this is fixed and we've gone back to the new version of YouMagine! Let us know if you find any problems! Please tell us here and also at info@youmagine.com if possible! Thanks a lot! Just did an upload, was indeed a lot better than before, no more error on the first picture. I do think the layout of the text in "description" looks bad, somehow I can only get it to just have one continuous text, all breaks are ignored. Please asap fix the change of the aspect ratio in pictures, on a pc it already looks bad, but on a smartphone in "portret" position it looks horrible (not talking overview pages, but pages of a single item). not sure if intentional, to fix later, but the reported behaviour on not going to the first page after a search, and being forced into a description for a collection is still there. Posted October 22, 2014 · "NEXT" YouMagine pre-release. RFC! Posted October 23, 2014 · "NEXT" YouMagine pre-release. RFC! Posted November 6, 2014 · "NEXT" YouMagine pre-release. RFC! A brand new pre-release of YouMagine is now available on next: https://beta:tester@next.youmagine.com (codename: release 06-11). On test.youmagine.com you can see more designs because we've mirrored more designs. This is great for testing the search. The site on NEXT will become released on www really-soon-now™. To make this release a success, we depend on your feedback. So give it a try! We're proud to say that Mark Moissette is now part of the YouMagine team as web application engineer! 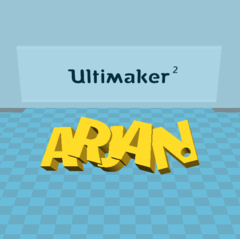 We've reintroduced the UltiViewer, the 3D preview tool for inspecting models. It has been greatly enhanced! It should be more stable and more modular, so we can create extensions and improvements more quickly. One cool feature that's coming up is annotations, you can point out specific points on a 3D model and comment on that. Also, you can add measurements between various points on the surface of a model, e.g. to check certain tolerances. Want to show what the thickness of a particular wall is? Annotations are a way to do this. After releasing the improved search we went on to make it even better! Being able to easily find what you're looking for is important. The search results will have a better ranking (popularity of items are taken into account). Will also include items with matching tags. It will have typeahead search, during typing you will already see search results appear! You'll even see little preview images of the items. Search will also become permanently visible in the top navigation bar (in the release after the upcoming one). We fixed several bugs! If you were on page 10 of a design listing, searching for a design resulted in 0 results because it would display page 10 of the results. Register and sign in with a few clicks using your existing Google account! More formats will now have (3D) and rendered previews! Also, it will automatically create STLs if it's not already an STL file. We now automatically create STL files when an SCAD, JSCAD, OBJ, DAE, OFF, 3DS or PLY file is uploaded. This means that you don't need to generate that STL export for your SCAD file, YouMagine will do it for you! We want to promote the uploading of native formats so we intend to start rendering popular formats into STL for you, so you don't have to add these yourself. We were thinking of STEP as the next one, but we're unsure how to generate STLs from STEP files, at this moment. If you have any ideas, let us know! For a design that is collected by someone, we've fixed that you can't press the "x" button to delete it from the collection if belongs to someone else (thanks for reporting, @Didier). The unread message counts should be correct now. File type icon sizes were off in some cases. The "share" buttons on a design's page should now work again. Zip files weren't always recreated for an updated design, should now happen. Search results can now also be retrieved in .json format. Great for those who integrate search in an application. Login icons are now bigger in the current release (thanks @Blizz). Please have a look at it on NEXT and soon on the main www.youmagine.com version! We'd love to know what you think! In particular we'd love to know whether you still have designs that you expect to find but can't find. There will always be a bit of debate of what is the best sequence, please understand that we can't make everyone happy, but if result ranking is just completely off. Tried the new previewer. Waited for 10 minutes to see if it would eventually load, nothing (except the "Please wait" notification that I eventually saw). Tried again, waited five minutes. No preview shows up. Firefox 33.0.2. Also, I see no mention of the "log in to view comments" and some of my other rantings from my thread a while back. Just last night I was fighting that "little" annoyance. Got a notification that someone had printed my design (doesn't say which one). I click the link, I'm forced to log in, site fails to load, try to click the link in the e-mail again, get a 404... Checked my messages on the site, nothing to be found. The comment system should be done differently. I think that a notification of a new comment should bypass the entire messaging system. Because this basically duplicates the messages. If the code wasn't compacted I might've taken a closer look but I couldn't be arsed with the code in that form hehe.